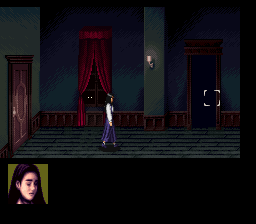 A pioneer title in the psychological horror genre, Clock Tower‘s haunting chimes echoed across Japan in 1995 but never reverberated beyond its shores until a PlayStation sequel was released stateside two years later. 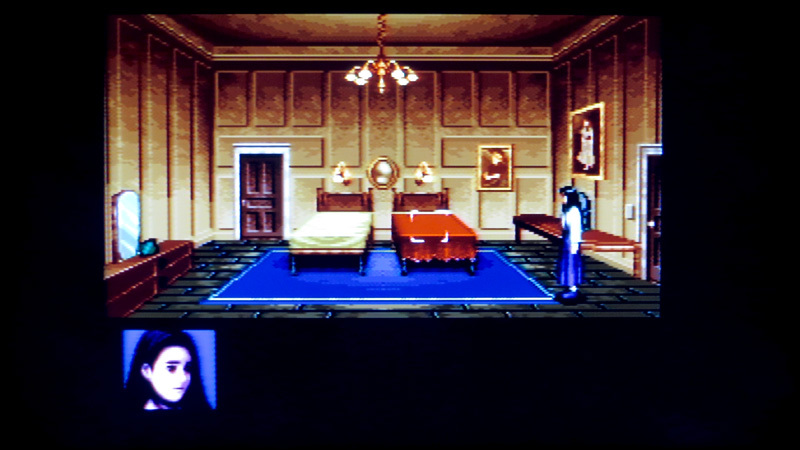 The original Super Family Computer game operates using a simple point-and-click system like an early PC adventure game, with the player controlling a cursor to traverse a lonely Norwegian mansion and interact with the chilling surroundings inside. 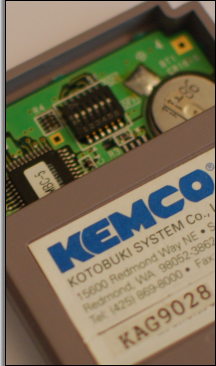 Commands are given through a regular controller, though, as the Super Nintendo mouse peripheral is regretfully not supported. 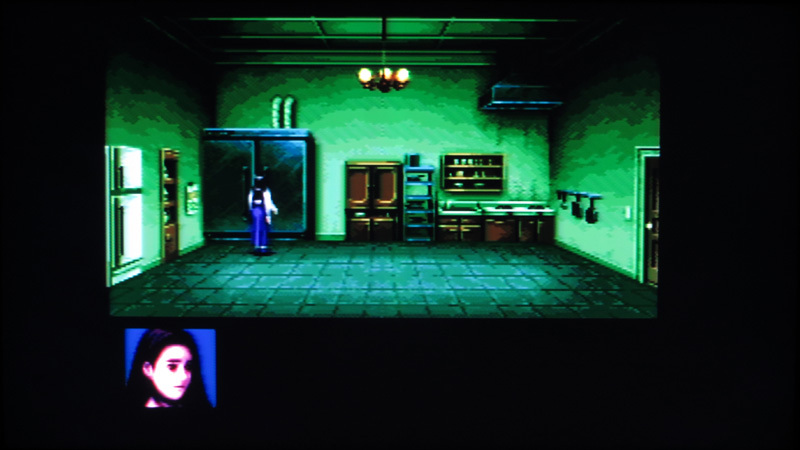 Clock Tower embodies survival horror in its most primal form: Jennifer Simpson, a frail young orphaned girl, has no weapon to defend herself from the threats that she will face while collecting clues to unlock the story. She must rely solely on her wits and reflexes, fleeing and hiding from danger whenever necessary, all the while keeping herself from becoming overwhelmed with panic. Not panicking is Jennifer’s only means of survival. As an early precursor to QTE encounters, rapidly pushing down the A button can sometimes momentarily thwart attackers long enough for her to make a safe getaway. 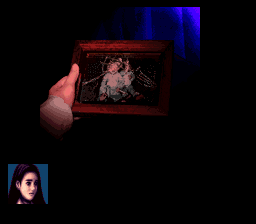 Players can monitor how Jennifer’s emotionally coping through the clever use of a portrait on the bottom of the screen, which shows her current stamina and mental condition. When her facial expressions turn to terror, she’ll begin doing her best impression of a Hollywood horror movie statistic by fumbling over her feet in a staggering state of shock to the nightmares around her. If her psyche becomes too unstable, Jennifer will succumb to fright and die. Some of the most effective scary stories have been told through the progression of gradual, slowly-building repetition: howling wintry winds, creaking old floorboards, scratching bony-fingered branches. 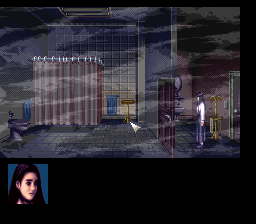 Clock Tower‘s minimalist ambiance follows this same pattern, replacing a steady musical soundtrack with mostly dead air in order to magnify every footstep, every falling water droplet from a leaky bathroom sink. This, in turn, instills a constant dread in the player, as if at any moment, any unspeakable evil can and will materialize from the darkness. This lurking feeling evokes life’s creepy moments, when you think you’ve heard a bump in the night or seen a shadow in the corner of your eye, and when you cautiously go to investigate, there’s that hesitation that you may actually find something to confirm your innermost fears. Jennifer’s confirmation comes to her yielding a giant pair of garden shears. A horribly deformed darling little boy by the name of Bobby, or “Scissorman” as he’s more affectionately called, incessantly stalks Jennifer throughout the entire mansion, leaping out at her when she least expects it. Chaotic, heartache-inducing chase music then breaks the deadly silence, as she runs breathlessly for a safe place to evade her homicidal pursuer in his sick sudden death game of tag. Scissor snips warn that Bobby’s gaining ground. 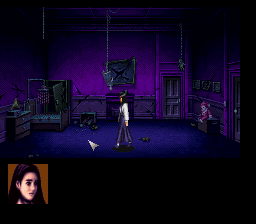 If you thought Resident Evil 2 contained some intense scenes of flailing zombie arms suddenly bursting through windows and unexpected monsters dropping from the ceiling, be forewarned: Experiencing Clock Tower is about being constantly unnerved and on guard at all times. That the game delights in the player’s non-linear exploration of rooms makes the scares seem even more devilishly self-inflicted. 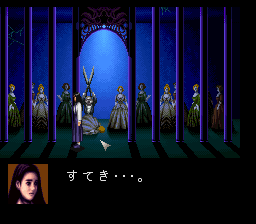 Without giving away the plot, Clock Tower tells a dark and twisted tale, one that in all probability doomed any chance of its localization by Nintendo of America’s standards at the time. In addition to unraveling the game’s many mysteries, the innovative multiple endings and randomized events make repeated visits to the eerie Burroughs estate consistently bloodcurdling–especially on a long, whispering, full-mooned October night. 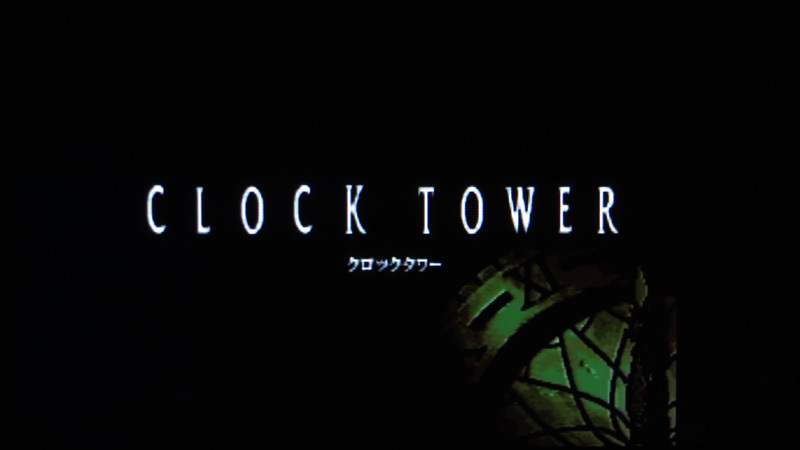 In November 2005, Laurent, the webmaster of Video Game Den, purchased a prototype of Clock Tower from Yahoo! Japan Auctions. 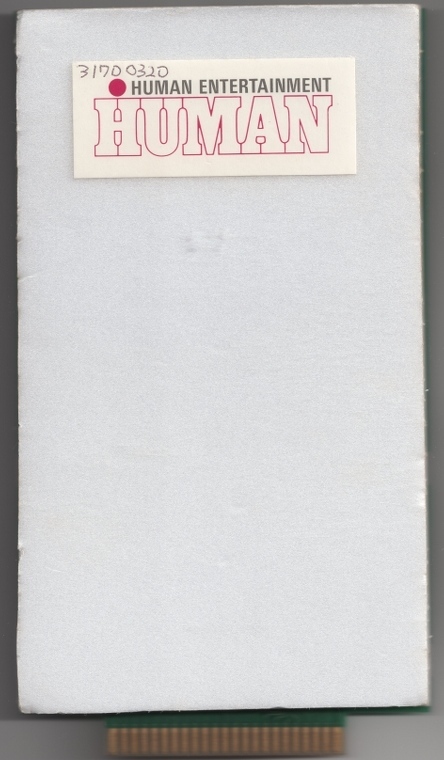 The prototype came to him housed in a typical Super Family Computer case with a Human Entertainment label marked in ink as “No. 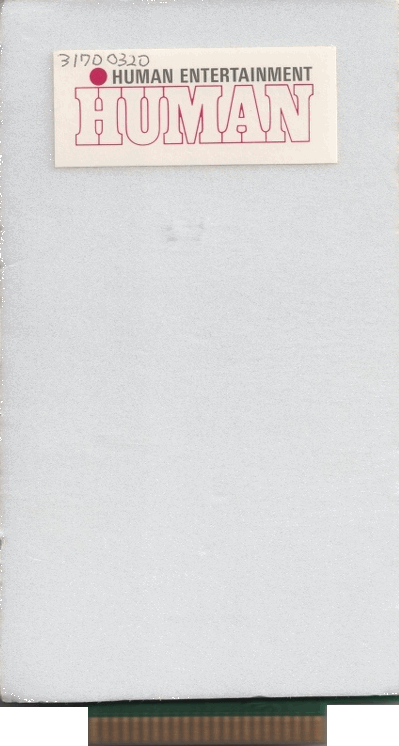 S-5.” It appears that more writing, perhaps the original recipient’s name, has been whited-out. 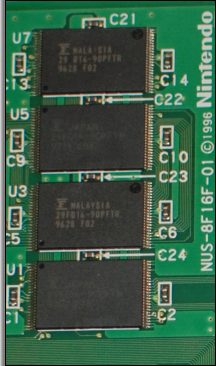 Inside, a standard SHVC-4PV5B-01 prototype development board contains four EPROM chips. 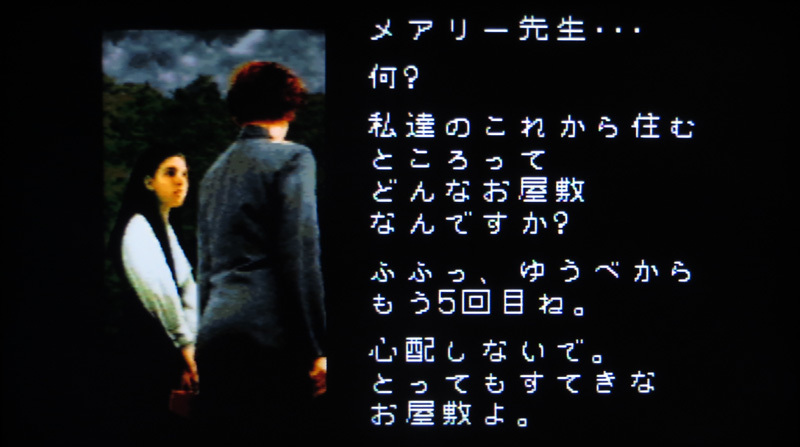 According to Laurent, the prototype starts with the same text and introduction sequence as in the retail game, showing Jennifer and the rest of the group walking towards the mansion. 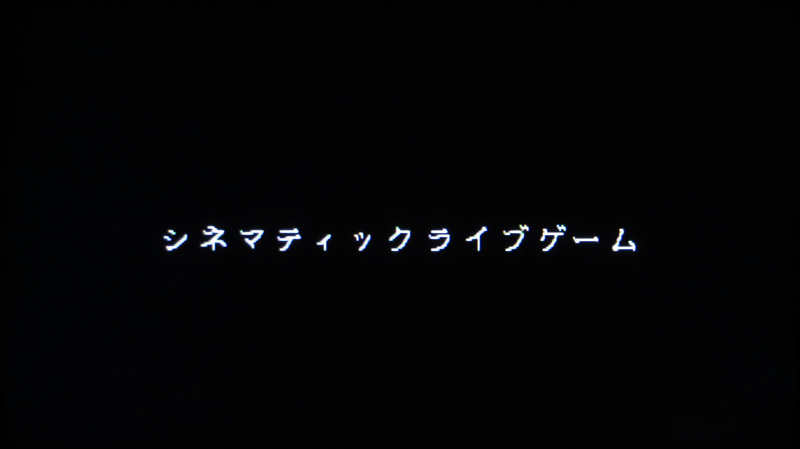 After the title screen, the prototype teases future segments of the game as well as some text, trailer-style, with release price and other information. 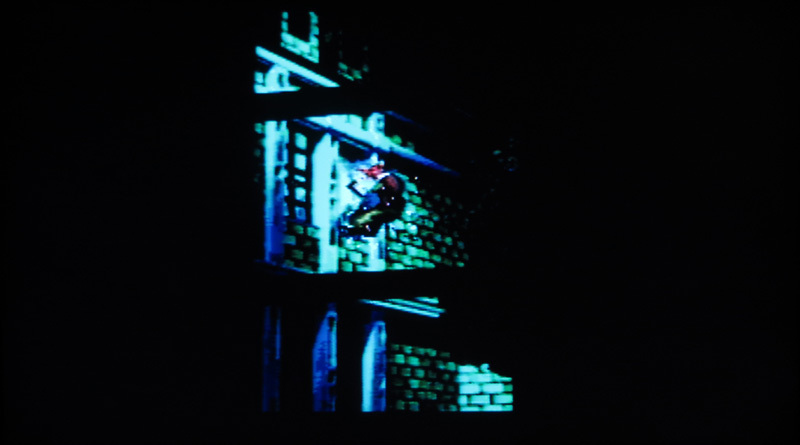 The trailer depicts Ann being thrown out of the window. Take note of Jennifer’s missing status icon. The kitchen in the trailer looks more or less the same as in the released game. 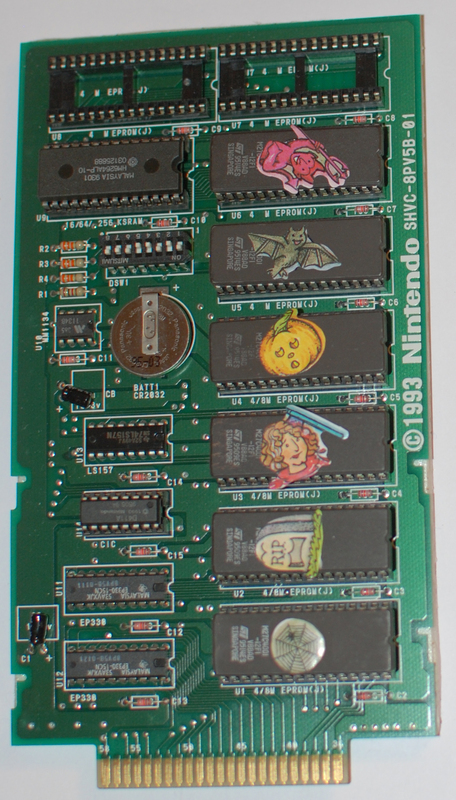 Then a special Sample Game selection menu appears listing three playable scenes from the game. 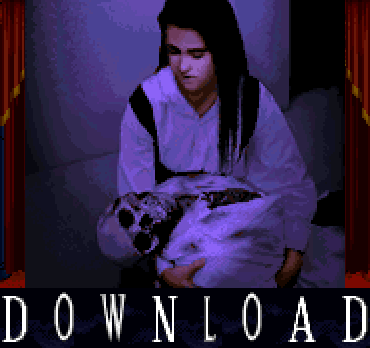 Choosing one of these scenes will transport the player to experience different scary moments. 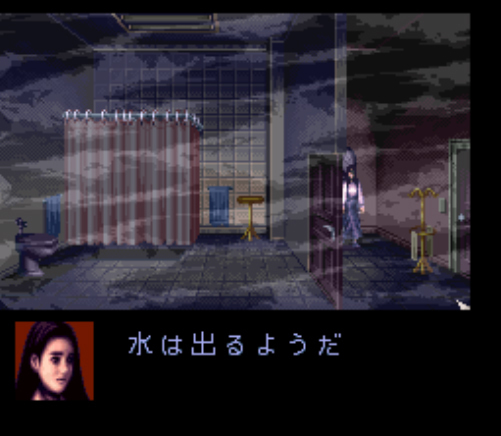 Each “Sample Game” is confined to a single room and ends if the player tries to exit. They each feature only one surprise element. “Sample Game 1” brings Jennifer to the music room. The surprise element in this scene is Scissorman hiding behind the curtains. 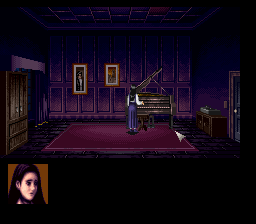 The piano and dresser can be interacted with, too. “Sample Game 2” takes place in the first bathroom. The surprise element of this scene is Laura taking a bath with Scissorman. 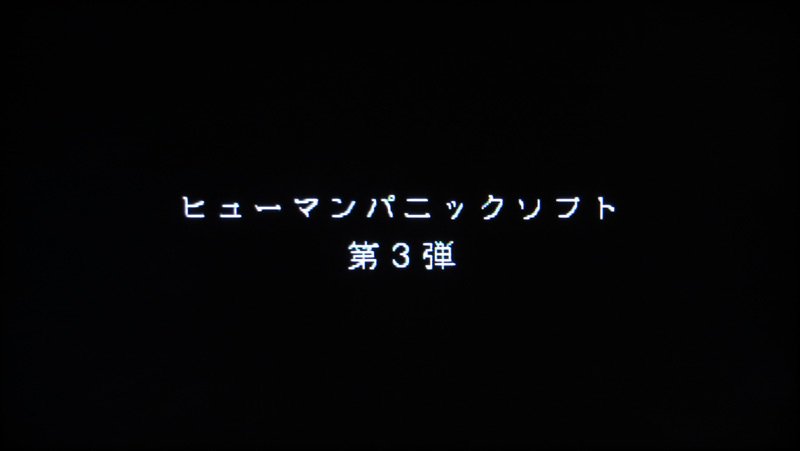 Finally, “Sample Game 3” occurs in the bedroom. The surprise element of this scene is the attacking parrot. 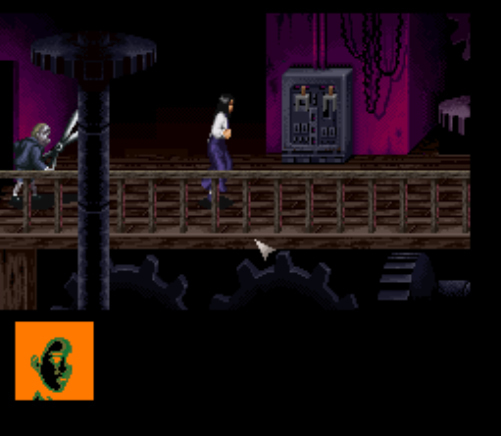 The player can return to the Sample Game selection menu by pressing Start at any time, leaving any of the rooms, or after witnessing a Dead End screen if Scissorman wins. 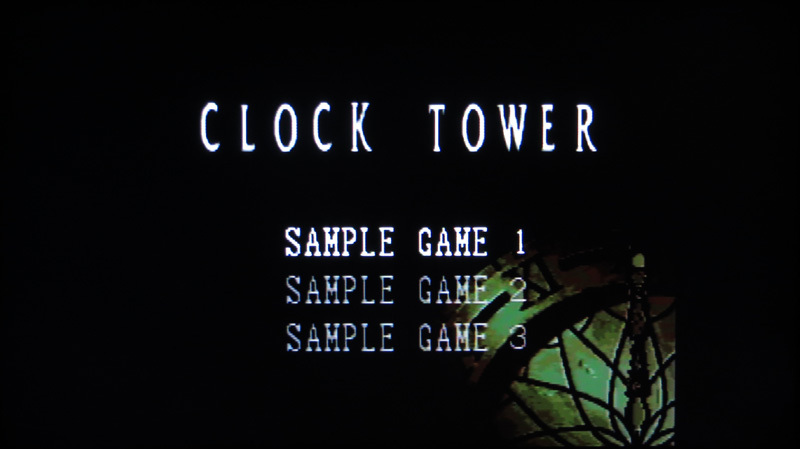 Based on the information provided by Laurent, this version fits the characteristics of a store sample that may have been used at a game shop to promote Clock Tower in Japan. Store samples often limited how much of the game customers were able to play in order to prevent somebody from hogging the kiosk all day long without ever making a purchase. The objective of these samples was to offer a small sliver of gameplay as a way of persuading the customer to go up to the clerk afterwards to pick up the full game. 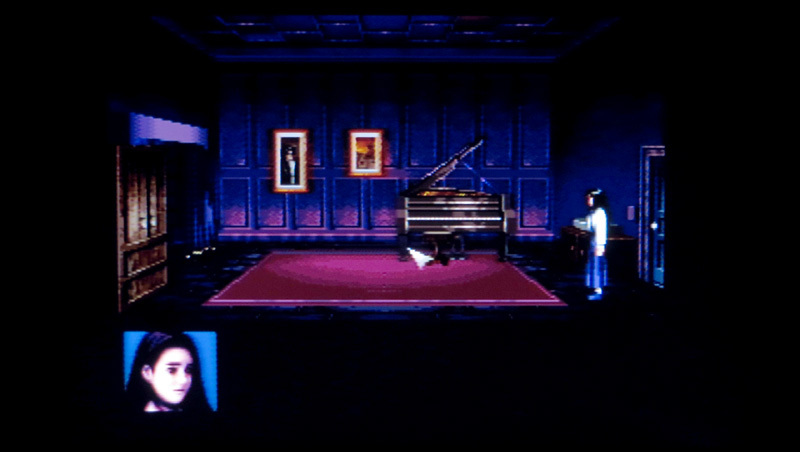 Keeping a lid on the majority of Clock Tower‘s secrets and scares would have surely required a highly-controlled demo setup like the strict three-scene boot screen described above. The inclusion of pricing information, however, is the biggest giveaway. 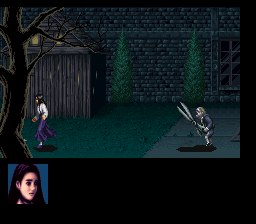 In May 2012, a second pre-release Super Family Computer version of Clock Tower appeared on Yahoo! Japan Auctions. 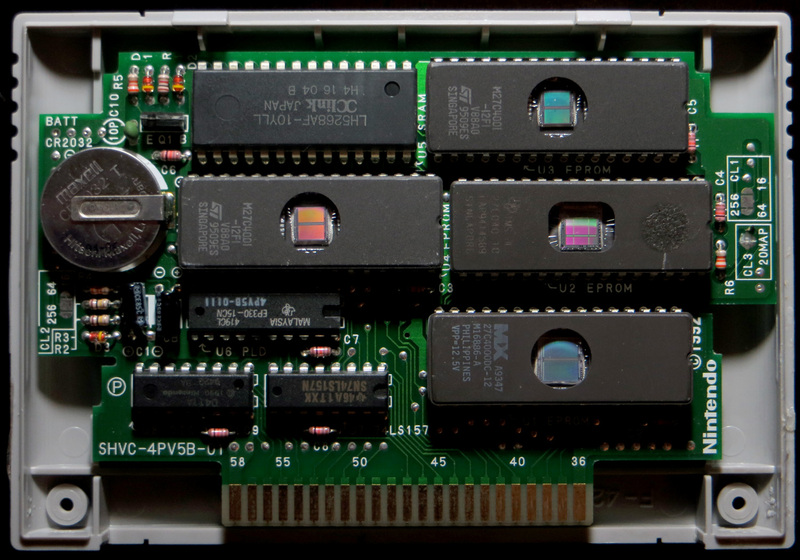 Unlike Laurent’s prototype, this time the board was bare and its EPROMs were exposed. Without fail, every time that I have pursued a prototype on Yahoo, a bidding war ensues at the last minute–and by the last minute, I really mean the last minutes, as the auction site graciously auto-extends the auction by five minutes if a bid comes in near the closing time. 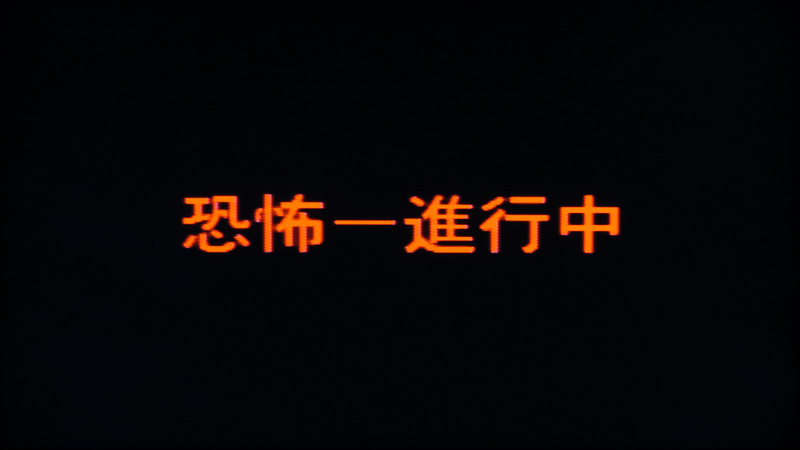 The same seller was auctioning a prototype of another Super Family Computer Human Entertainment-developed title, The Firemen, at the same time. That game sold for less than half of what Clock Tower ended up costing me. Before tearing open the EMS package from Japan, I went shopping for Halloween costumes for those EPROM windows. 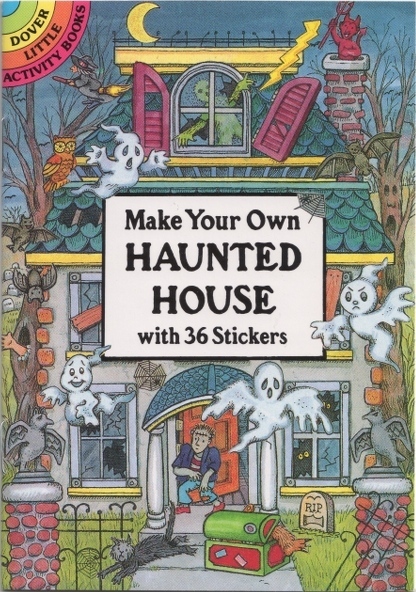 I eventually settled for a sticker book, also first published in 1995, that would be most appropriate for a video game set inside of a spooky, dilapidated mansion: Make Your Own Haunted House with 36 Stickers. The best sticker is the bloody, dismembered, axe-bludgeoned head. The second best is the cheerful-looking pink demon giving the thumbs up. 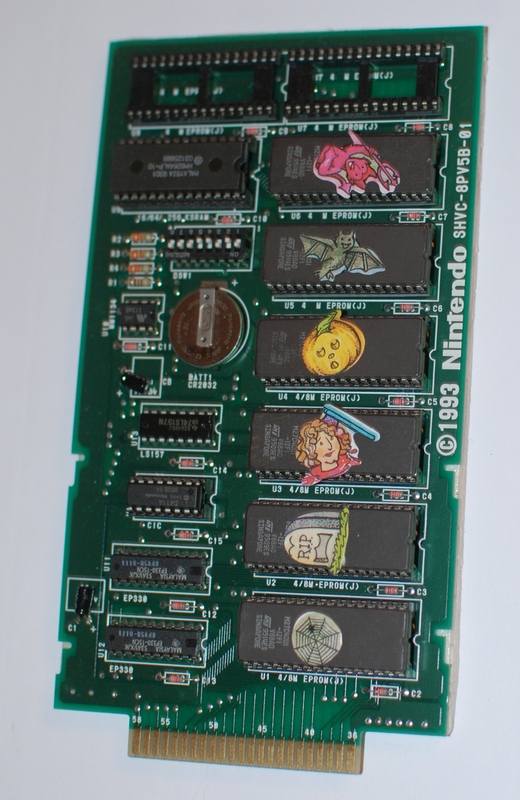 The long development board has a white cardboard backing. 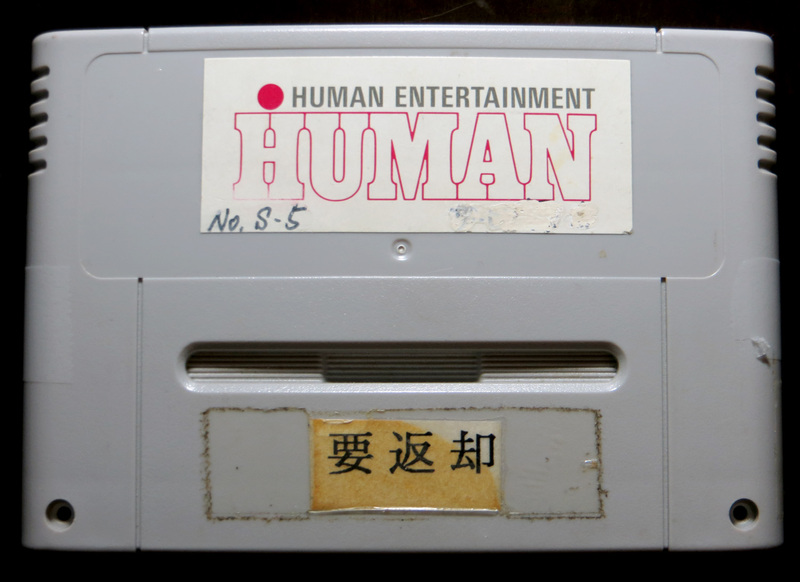 A Human Entertainment label, similar to the one seen on Laurent’s pre-release cartridge, has a number written in pencil at the top, “31700320.” This might have been an ID number used to keep tabs on this particular prototype when it was loaned to the Japanese gaming press or to guidebook writers. When I sat down to do comparisons, it didn’t take long until I realized that I was in way over my head. 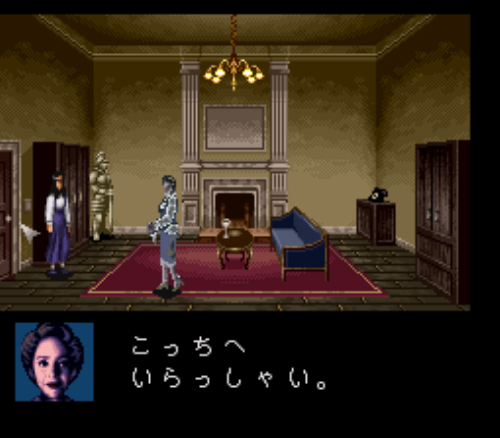 Clock Tower is entirely in Japanese, and I had foolishly forgotten that I had played an unofficial English translation version years ago, and not the original game. The extent of my foreign language abilities only go as far as knowing how to ask where la biblioteca is en Español, and some French train vocabulary, so to even attempt a comparison of software that lacks both libraries and locomotives would be nothing short of disastrous. Fortunately, I had help this time, and it came from the unlikeliest of places–the very same bidder whom I had battled on Yahoo. Alice Thompson is a true collector in every sense of the word, a passionate and knowledgeable fan and cataloger of anything and everything involving the Clock Tower series. When she saw the prototype appear for auction, she desperately wanted to dissect its data. Despite needing to go to work in the morning at 5 A.M., she stayed up all night staring at her computer screen to make sure that she would win. When my bid sneaked in near the end, she immediately retaliated. 31 blows later, and the war raged on. She would have continued to fight, too, had it not been for her Internet connection failing. After the smoke cleared, she rightfully felt heartbroken and angry at losing. 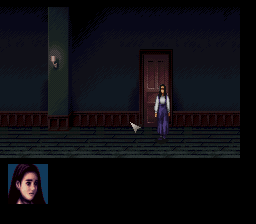 For, you see, Alice’s only goal was to preserve, examine, and curate the prototype on her Clock Tower fansite, Stalking Insanity. My heart sank after hearing her side of the story. I always assume the absolute worst while in the trenches of a bidding war; it helps to dehumanize my auction foe as a sweat-fountain–a Cheeto-breath, gelatinous blob of nerd meat whose sole joy in life is to collect prototype hardware in a closet like Ed Gein used to accumulate human skin from his helpless victims. Here, instead, was this nice woman about to get married, whose enthusiasm for the series was both inspiring and contagious. I didn’t feel right offering to sell the game to her for what I wound up paying, as I was the one responsible for jacking up the price by hundreds of dollars in the first place. 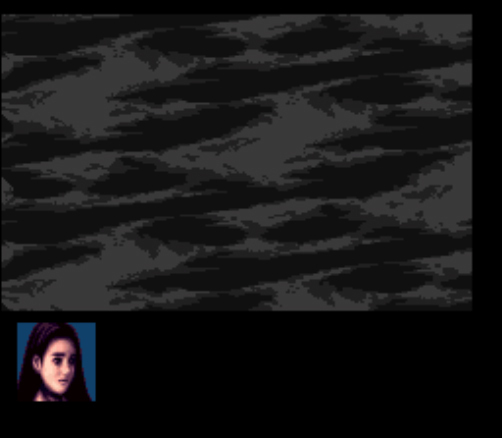 Instead, Alice was the first to receive the prototype’s binary and go through the game herself. We had come from fighting each other to now teaming up to properly document the code. If two fierce bidding warriors can come together and shake hands, there may yet be a chance for Internet peace after all. Spoiler Alert: Skip this section if you haven’t yet played the game! The prototype contains some rather strange glitches. For example, here Bobby and Jennifer are doing their panic evasion dance, only Jennifer is about a yard behind Bobby, who is facing away from her. Her stamina icon remained normal when she was fighting Bobby, but it changed after Bobby was knocked down. 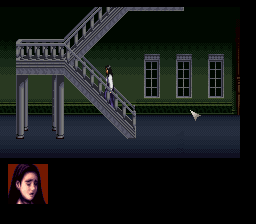 The game repeatedly depleted Jennifer’s stamina, without running, down to zero by simply entering the first bathroom without even checking for Laura’s body. Jennifer’s icon goes to the no-stamina icon before switching to the normal icon but with the red background. This bug might affect rooms that trigger panic events, as it also happens in the telephone room and in Bobby’s room. Then, upon entering the bedroom and exiting out of the lounge room to get over towards the other hallway near Foyer 1, Jennifer’s stamina reset to full and she wouldn’t take any damage, not even from Bobby. Even when using cheats in the retail version, a kill-attack hit will result in a Dead End. Heading again into the bathroom after the red status drop and the stamina recovery glitches causes the transparency of the steam to break so that nothing can be seen. The game has to be reloaded to get it back working properly. 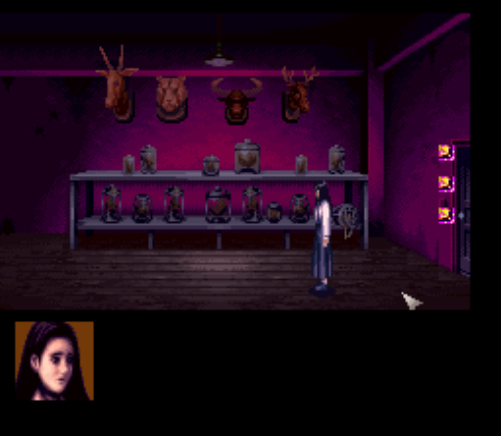 On one occasion, entering the taxidermy room caused strange purple sprites to appear by the doorway. These went away after exiting and re-entering the room. Jennifer’s stamina icon sometimes glitches into a Halloweeny orange and green blend of colors. 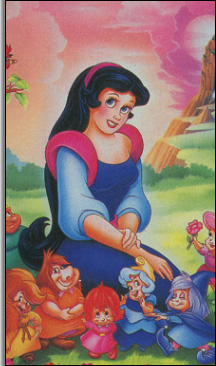 That icon is supposed to be Jennifer’s absolute no-stamina expression. 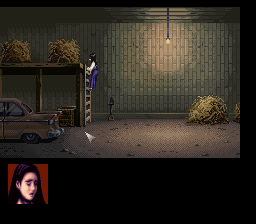 This glitch is triggered by switching off the lights either before or when Mary Burroughs is in the room. 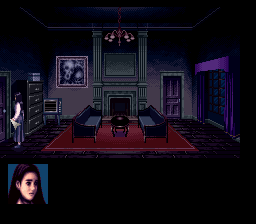 The retail version has the sprites flicker, but for some reason, the lights in the room stayed on and Mary ended up looking like she had just walked through a spider web. 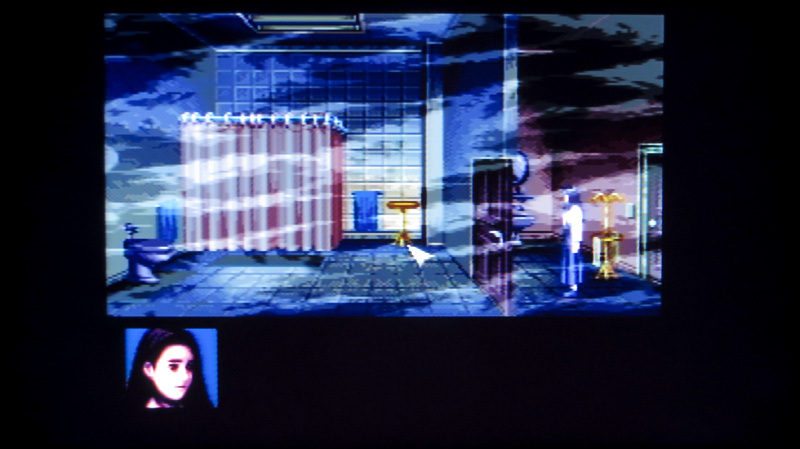 The randomized eyes in the window, which are triggered randomly when starting the game, occur more often when being chased by Bobby, and the television turning on happens less frequently in the prototype. 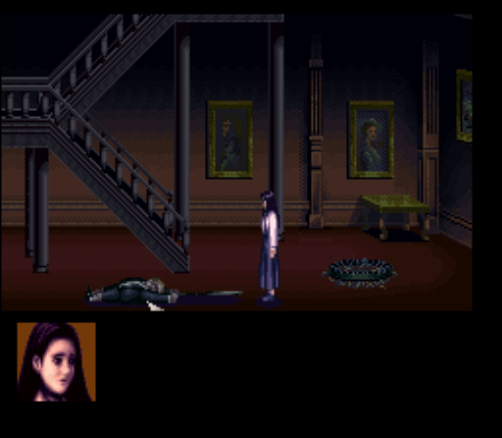 The Scream portrait bleeding didn’t occurred at all after six playthroughs, three for the demon idol path and three for the scepter path. All of these events are normally common triggers across all versions of the game. The Foyer 1 and 2 glitches don’t appear in this prototype. 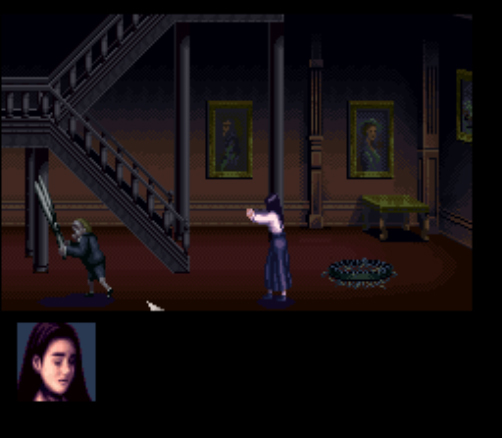 Running the retail version on an emulator sometimes causes a crash when the player goes up the stairs in either of the two foyers while Bobby is in hot pursuit, or if it doesn’t crash, then a graphical bug appears in part of the layered sprites. Bobby also doesn’t time out and end up leaving the room either, which again happens if the player goes upstairs in the retail version; this is uncommon, but it does occur. If you go up the stairs in Foyer 1 while being chased, after about five minutes or so, Bobby times out and the game treats it as if he’s just left; this doesn’t happen in the prototype, either, after leaving the game idle for about 30 minutes. 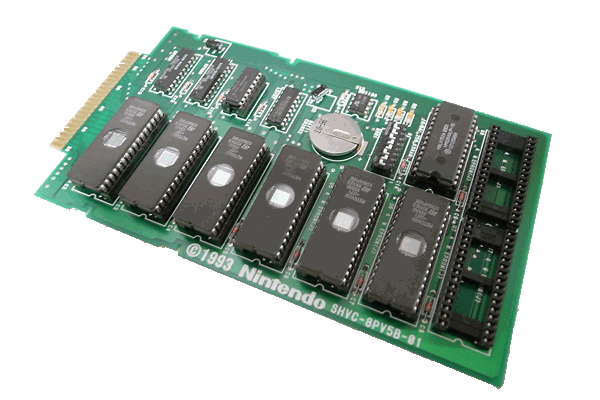 As general observations go, the prototype runs faster, with little-to-no loading lag, and Bobby seems to spawn farther away in contrast to the retail game when timed with both Snes9X and ZSNES emulators and the PC and the PlayStatation versions. Perhaps as a result, the prototype mucks up its music cues at times. And speaking of music, the soundtrack sounds very slightly different. Some of the visual wave lines of the tracks do not match up. 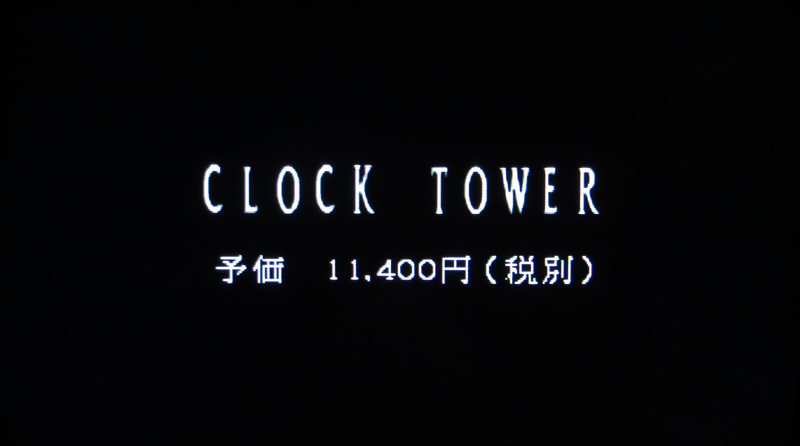 Notes: In the prototype, the “Theme of CLOCK TOWER” piece is actually about a millisecond delayed. Notes: “Bobby B” is actually “Bobby C ” but with “Shock” included on the track. 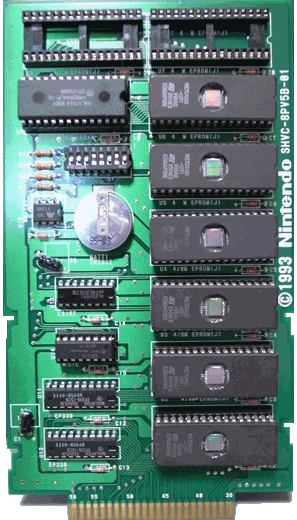 The retail version plays “Shock” and then “Bobby C,” but in the prototype version, “Shock” actually precludes an alternative version of “Bobby C,” which also uses a higher pitched looping beat not found in any other version of the song. Notes: Sounds the same as the retail version. Notes: Nearly the same as the retail version. Notes: Slightly shorter than the retail version. Finally, there is no difference in the text between the prototype and the retail version.